Last week we circulated the 32 All-Conference teams which was in turn run in great posts like this one from Fresno State (top photo below). 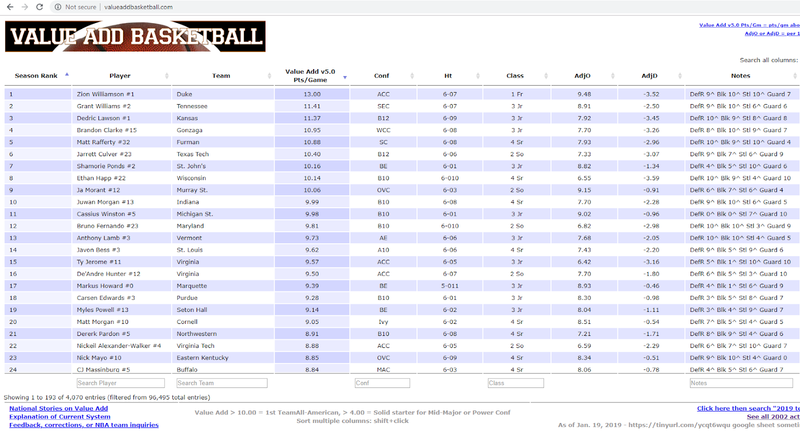 This week we simplified the figures on offense and defense to represent the points per game a player improves both the offense and defense per game at www.valueaddbasketball.com (see second photo). Here is what each column means for the top-ranked player. Zion Williamson has the "#1" for his jersey number for Duke, and the 13.00 means he improves the final score by 13 points over a replacement player (turns a 5 point loss to an 8 point win). Continuing down the columns, his conference is the "ACC," his height is "6-07," he is a freshman (1 Fr). He improves Duke's offense by 9.48 points, and his defense takes -3.52 points away from opponents - both his offense and defense are the best in the country and add up to the 13.00 total value. While breaking down each players defensive impact is complicated (see factors here), we broke down the four aspects of each player's defense on a scale of 0 to 10. Williams ranks as a 9 in defensive rebounding (DefR 9^), a 10 in blocking shots (Blk 10^), a 10 in steals (Stl 10^) and a 7 in the Guarding calculation which factors all the other ways they can stop opponents from scoring in the context of offenses faced for a "Guard 7" of 10. 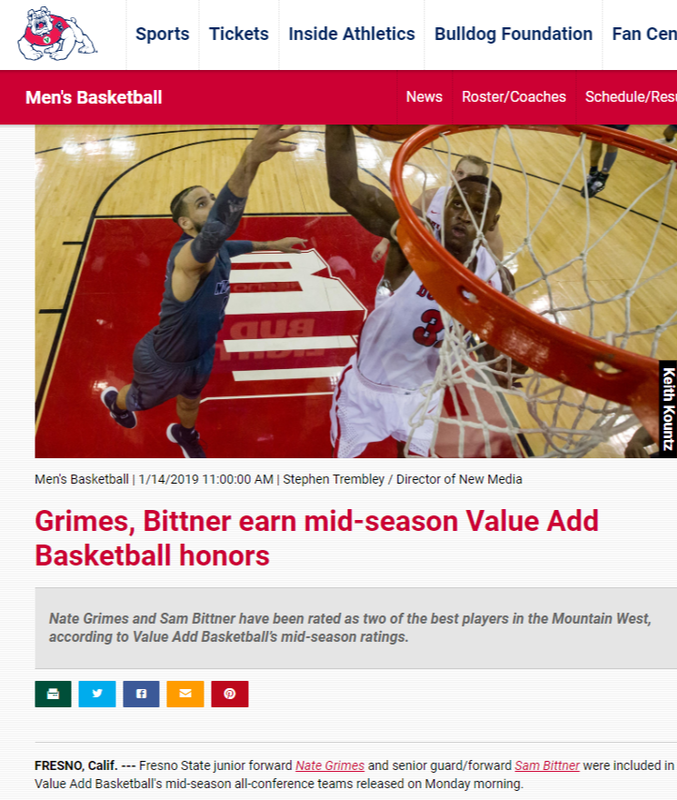 As you can see at www.valueaddbasketball.com, this lets you sort by conference to get the updated All-Conference players at any point in the season, or sort by best defender or offensive player, freshmen, or just pull up your team. One note on the top ranked players - the system basically assumes that the team calculations are accurate at www.kenpom.com. There is one weakness in the system, of which he is aware, in that a complete reliance on margins of victory does assume every point allowed or scored is equal. While this usually works there are exceptions. For example, he calculated Marquette was the 35th best team in the country when they were 3-2. Since then they have gone 13-1 including wins over three top 15 teams - Kansas State, Wisconsin and Buffalo - a neutral court win over a Louisville team that went into UNC and killed the Tar Heels, and a win at Georgetown with star Markus Howard (see below) out with back spasms. After that incredible run, they went from the 35th best team in the country to the ... 35th best team. This happened because over those 14 games their overall victory margin was almost exactly what the prediction was on www.kenpom.com AS A WHOLE. So on January 1 he projected Marquette would win by 1 and since they lost by 20 that is a -21 for the game. On December 4, he projected Marquette would beat UTEP by 21 and they only won by 7 so that is a -14. So those two games out of 14 dig them a whole of -35. In the other 12 games during that 13 game streak they averaged doing 3 points BETTER than projected, a huge factor since just 10 points fewer in regulation of 5 specific games would have turned those five games from wins to losses. Obviously those 10 points were much more important than some additional points against UTEP or St. John's, but the math is that a point is a point, so while Marquette has shot up in the NCAA's NET ratings (replacing RPI) and coaches' and writers' poll, they are still at 35th at www.kenpom.com. This revives the old argument, is a team that wins more games than they should based on point differential "lucky" or "clutch." The beauty of the www.kenpom.com ratings are that the breakdowns of how each player performs is unmatched - and www.valueaddbasketball.com goes from their to fit all his stats into one overall calculation of the player's overall value. I do believe the NCAA's NET ratings are actually the great figure to use for tournament invites etc. because by accounting for playing a great team tough, they cap the victory margin at 10 so that beating a team by 40 instead of 10 does not help the NET rating the NCAA is using, even though it will greatly improve the team's rating at www.kenpom.com and the player's rating at www.valueaddbasketball.com.